Are you looking for off-site storage for your Lloyd George Envelopes, Medical Records and/or Patient Notes? DataSpace are here to help with our easy and flexible solutions! DataSpace are Document Management and Storage specialists experienced in storing and managing a variety of records for businesses in all different sectors. DataSpace have securely stored and managed records for Private Medical Organisations, NHS Trusts, Dental Practices and Health Care Centre’s for over 13 years. DataSpaces facilities are BS5454 compliant and accredited and we are also registered with the ICO, PCI DSS and the NHS IG Toolkit. 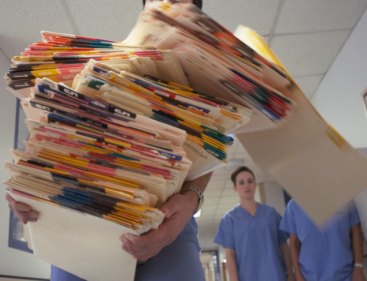 Storing your records off-site will give your practice or surgery more space that then can be utilised to provide more services to your patients. Members of your practice team will be able to spend more time directly on patient care and their key responsibilities rather than searching through your patient archives. All DataSpace employees are CRB checked and sign non-disclosure agreements prior to employment as an extra security measure. DataSpaces Scanning Services are comprehensive and we are able to scan items including paper records, microfiche/film, books and even Cardiotocography CTG tracings plus many other forms of records. Whether you need a Bulk Scanning Service – where we scan all of your records in one planned project, or a Scan on Demand Service, where we scan your items as and when you require them. We also have the ability to host your scanned documents on our secure online portal FileLive. FileLive is BS27001 compliant and accredited which is the British Standard for the Information Security. Our Scanning Services are also accredited with BS10008 which is evidence of best practice for managing electronic information as legal evidence. Digitised documents are easy to maintain, track and trace and protect from damage or loss to which paper documents are often exposed to.